Last week, when I told you how I finally finished up my wall of city art, I really thought I was done with it. I mean, I even said “completed” right there in the post title. The day before I told you about my supposedly completed wall of city art, I mentioned on a completely unrelated note that I’d really like to try adding a little bling to the corners of my picture frames, a la this photo from a recent issue of BHG. 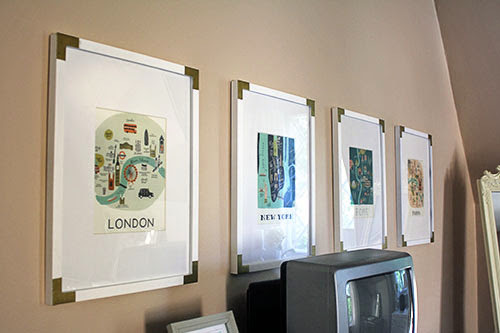 Yes, you’re in for another day of those framed city prints, and today I’m going to tell you how I gave them fancy gold corners! 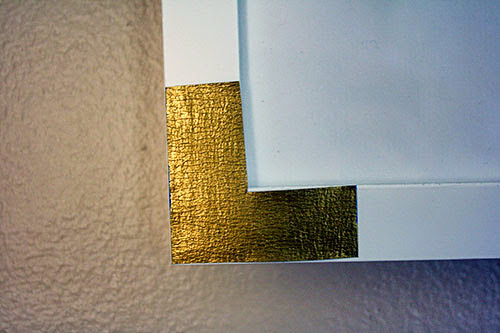 Fancy gold corners made entirely with supplies I had on hand! Removable fancy gold corners, even, on the off chance that I’d like to remove them someday. For now though, they’re quite lovely, and I expect they’ll stay put for awhile. 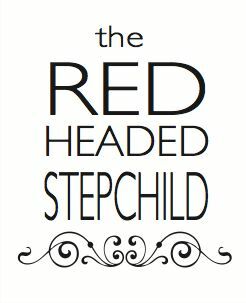 But of course, before we get to the end result, I’ve gotta walk though all the mishaps along the way... including the fact that, at first, I was going to make them fancy silver corners. 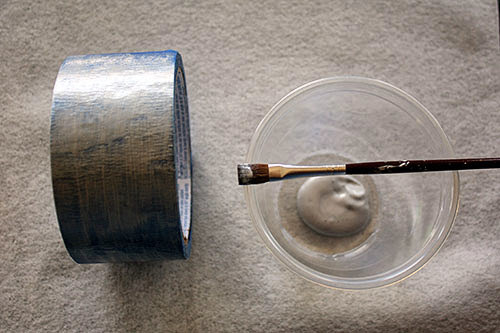 The rest of the room has mostly silver finishes, so I decided to try painting blue painter’s tape with silver craft paint. Pro tip: if you want removable SILVER corners on your frames... just use duct tape. Because that’s what it’s going to look like anyway. Strike one! So, I abandoned the silver idea and went for gold. Eh, mixing finishes is totally stylish today, right? A bit of warm gold in an otherwise silver room? Sure. 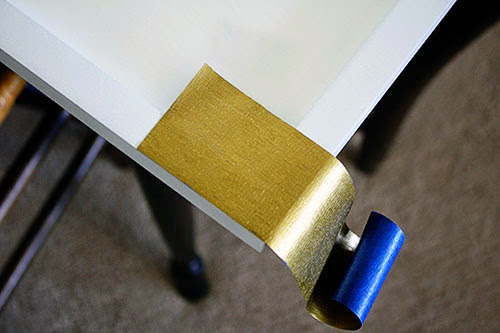 To speed up the tape-painting process, I used my gold paint pen (last seen creating my faux leaded glass mirrors) instead of the gold craft paint. 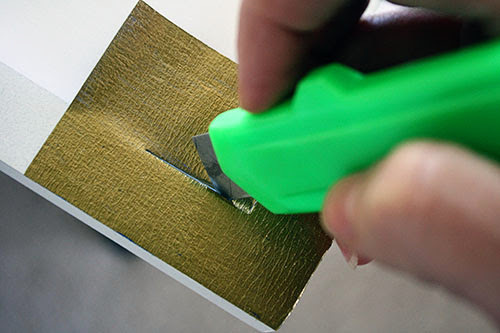 The paint pen required just one coat for full coverage on the tape. It also dried virtually immediately, as well. Still, I gave it a few extra minutes to set while I made some rough calculations on the paper towel I was painting on. 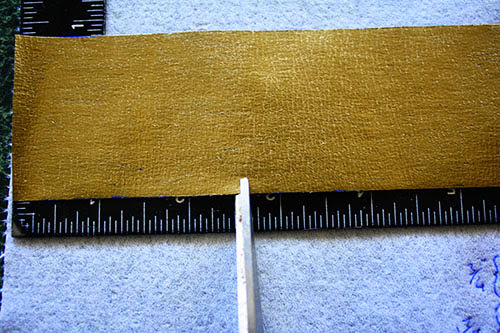 I didn’t want to paint more tape than I was going to use, so I designed a sketch (there on the left) to determine the exact measurements of the L-shaped gold corner. My tape was 1-7/8” wide, so I decided to make the L both 1-7/8” tall and wide. The frame was 3/4" thick, so the L was as well. And two L’s stuck together, as I diagramed them? A rectangle that’s 1-7/8” by 2-5/8” (1-7/8” + 3/4"), minus that bit in the middle. I know, compound fractions are SO HARD for you and every other fourth grader, but you can easily adjust these measurements to your tape and frame, I promise! 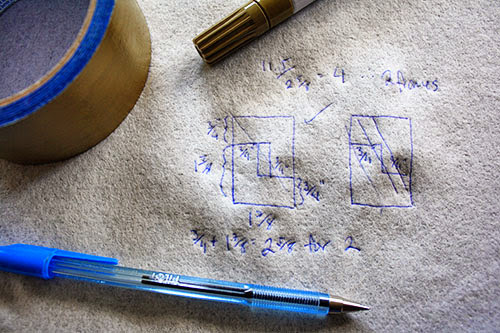 At first, I was so confident in my calculations that I thought I could simply free-hand cutting out the shape. 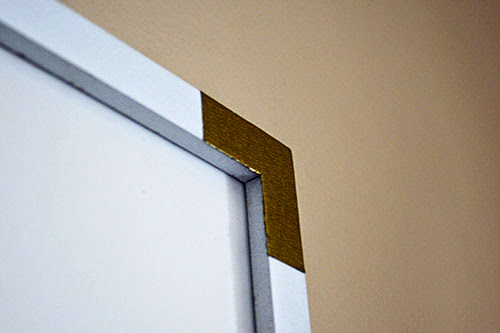 But that turned out to be a terrible idea, considering how the edges of the gold corner didn’t line up with the edges of the frame, no matter how carefully I cut. So, with strike three looming, I switched gears and decided to cut the tape with a razor blade, directly on the frame. My calculations weren’t totally for naught, though, as I still made the 1-7/8” x 2-5/8” rectangle, and simply trimmed off the excess as I went along. And this plan worked perfectly! Check out how nice the corner looks when I trimmed it this way instead! Strike three narrowly averted! 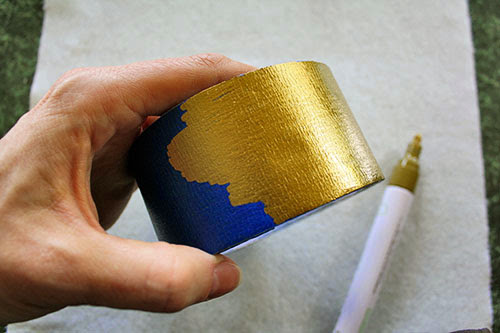 Just a few minutes to paint the tape gold – I painted all the way around the roll approximately two and a half times. Attaching and trimming the corners took less than an hour – again, just a few minutes per corner. Pretty swanky looking for a free hour-long project! 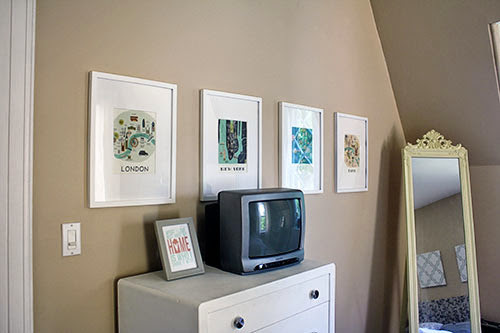 And now, I hereby promise to shut up about these city art frames. At least for this week. I don’t have any new ideas for them, but hey, famous last words. 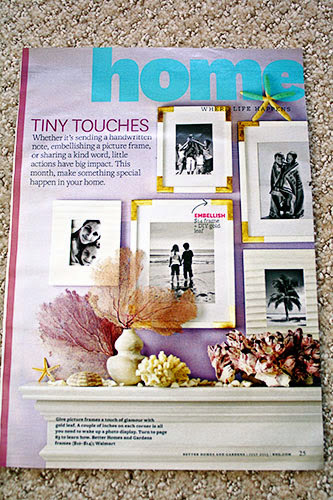 Have fun bling-ifying your photo frames on the cheap, dear readers!